Pat Straub. GRG owner, outfitter, member of the 12-Step Salmonfly program. My first float trip as a Montana fly-fishing guide occurred 20 years ago on the Yellowstone River outside of Gardiner. The flow was high and fast, clocking in at just under 10,000 cubic feet per second. Thankfully salmon flies were abundant, the trout hungry, and the anglers in my boat were decent casters and even better listeners—my inaugural float trip was a success. Little credit went to me, as the true champion of the day was the salmon fly. 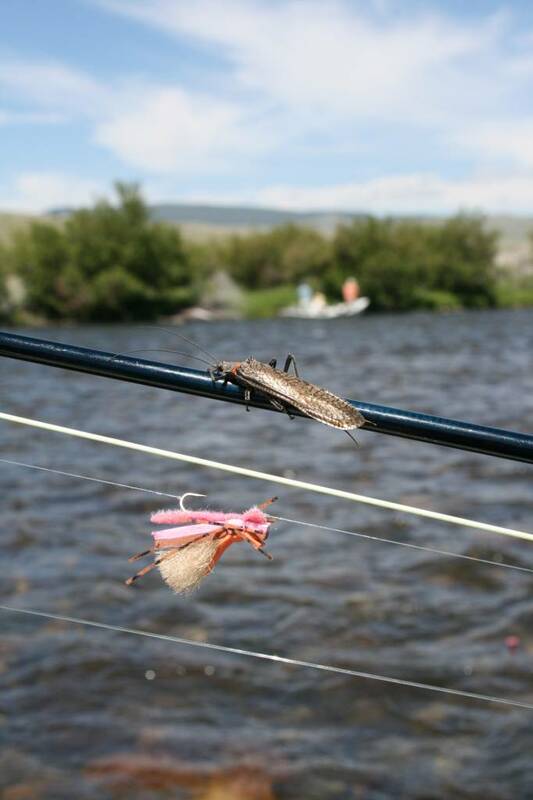 Beginning soon on many of our local waters, hatches of this large aquatic insect will signal the start of another summer fishing season in Montana. Over the next few weeks, salmon fly nymphs will migrate toward the banks of the rivers. As stream levels drop, and water temperatures rise, the nymphs will metamorphose into large flying insects in which anglers delight—trout gobble these salmon flies en masse, excited for food after a long runoff. With the appeal of such a gigantic insect—some of the adults measure up to 3 inches long—over time, myriad salmon fly dry fly patterns have been developed. Here are my favorites. Parks Salmon Fly. A variation of the original Pat Barnes’ Sofa Pillow, but tied with elk hair instead of squirrel tail, this fly is the creation of Richard and Merton Parks of Parks Fly Shop in Gardiner. It’s also the first, and only, salmon fly I fished on my first guide trip. Today, it effectiveness proves useful as it fishes well as a dry, but because it is absent of foam, it will become submerged and trout will feed on it under the surface as well. Rogue Foam Stone Fly. Created by Jack Schlotter, a Colorado angler, this fly features a bullet head and segmented foam body. If you’re not an experienced fly tier, purchase these to save you time so that you can fish more. This pattern is best fished as a single rig, and is great for fishing tight to the banks or among the willows. Tied with a sheet of foam under the hair wing, this pattern is ideal when adult salmon flies are seen fluttering on the surface. It casts well and can float low enough that it can represent a partially submerged insect. Fat Frank. Tied with regular and furry foam, rubber legs, a large wing, and even eyes, this fly floats high and matches the profile of an adult salmon fly perfectly. Nearly unsinkable, I first started using this fly on the Madison River as part of a two-fly rig, tying a Pat’s Rubber Legs to it, and fish ate both flies. But the Fat Frank’s ability to float high allowed me to fish a larger rubber legs than with any other big dry fly. Compared to the Rogue Foam or Chubby Chernobyl, the Fat Frank is a relative newcomer. I’ve found that this is a good thing—it’s just a little out of the box from many of the current patterns and I believe it sparks some curiosity as it floats by a hungry trout. Chubby Chernobyl. For most millennials, this fly is their traditional salmon fly. But there’s nothing traditional about this fly—it is foam, with a poly or antron wing, rubber legs, and flashy Z-lon synthetic material. Like millennials, this fly wasn’t around before they were born, but it catches fish and is ideal for use in fishing two-fly rigs. Whether you fish two-flies or not, the Chubby Chernobyl should be in your arsenal. And if you fish with any millennials, be prepared to get funny looks if you don’t fish with two flies because they’ve always known a world where two-fly rigs are standard, along with their Netflix and chill. Salmon Fly X. This is the wildcard pattern. Each year there is always one pattern that stands out from the rest. Some years it’s a more commonly known pattern like a Noble Chernobyl or a Cat Puke. Other years a lesser-known pattern, such as a Water Walker or Bloom’s Barely Kicking, can be the most successful. How do you know what the pattern is this year? Spend more time on the water with your own trial and error, and if you can’t do that, hang out at your local fly shop. In nearly a quarter century of guiding the salmon-fly hatch, one thing is clear—you cannot plan for it. All you can do is watch streamflow charts for a drop in level, contact your local fly shop for daily fishing reports, arm yourself with these five flies, and when chatter of the hatch begins, drop all responsibility and head to the river.